Home - Events - Programs and Activities - Gallery walks and tours - Vintage, Upcycled, & Refurbished: What is the “End of the Line” for Our Stuff? Vintage, Upcycled, & Refurbished: What is the “End of the Line” for Our Stuff? Join us for this behind-the-scenes tour where we will learn about the life cycles of our material culture and get up close and personal with museum objects that you might also see in antique shops or at auction today. What happens to our belongings when we’re through with them? Often, they lead a second or third life after ours. Sometimes they end up in a dump as trash, and other times they end up in a museum as treasure. More often than not—it’s somewhere in between. This program is inspired by Queena Stovall’s artwork on view in the museum’s exhibition, Inside Looking Out: The Art of Queena Stovall. 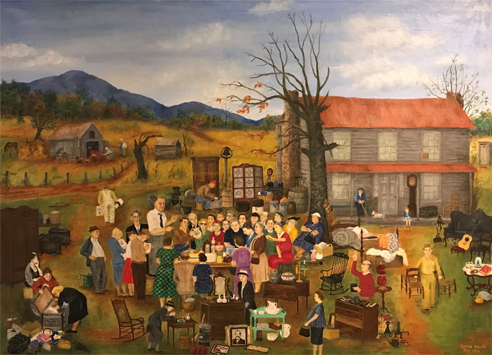 “End of the Line” depicts that middle ground for objects as they transition from one owner to the next: an estate auction in Amherst County in 1960. Even in the mid-twentieth century, many of the objects in Stovall’s paintings were “vintage” or had been refurbished by second and third generations. This program will pull objects from the collection of the Virginia Museum of History & Culture, like those seen in Stovall’s paintings, and trace their stories through multiple generations. Learn about the life cycles of our material culture and get up close and personal with museum objects that you might also see in antique shops or at auction today.